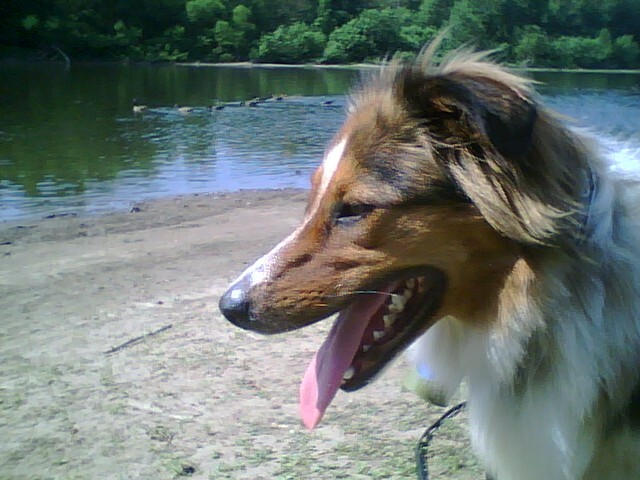 Luci celebrates a year on earth by herding Canada Geese and goslings into the Susquehannah River. I love the end of spring for all its diversity and color. The urgent heat of day and the refreshing coolness of night. The purple and blues of lupines, iris, chive and sage; the pinks of roses, peonies, dianthus-ish volunteers; the greens of grass, stalks, stems, leaves and needles–all creating a kaleidoscope effect of daily changing patterns and hues. Birds provide an evolving instrumental accompaniment of song tones and percussive calls. This spring my library holds a copy of The Happiness Project by Gretchen Rubin, a book I make sure I read at least once a day. I have taken quite a few of her suggestions to heart, including the suggestion to create my own happiness project, the only goal of which right now is to be happier more frequently. Research has shown that what we do frequently has more impact in making us happy than what we do once in a while. I am paraphrasing here, but that concept struck me as a real Secret of Adulthood. It really matters that I have a perpetual calendar where I record the high and low temperatures, the colors in the meadow, the moment I hear the first bluebird or robin or oriole. It makes me happy, a little bit every day. I have been thinking too that Ms. Rubin’s admonition to be serious about play is seriously appropriate for my serious self. Hence, my resolution to have an adventure at least once a week…..that adds up to 52 adventures a year. The anticipation makes me happy! The planning makes me happy! The savoring will make me happy! And recalling these adventures here, on this storytelling blog, will make me happy! I have a project!!!! or a little bit of one. It is at this point, one mile out, that Luci seems to feel the heat rising from the macadem, the sun striking us from its climbing position. The river-driven breeze dies down, and her tongue lolls out, dripping big drops of saliva. Her brown sable eyes ask “The end now?” and Luci seems only mildly relieved as we head down the bank to the riverside tree-shade. Gamely she trots on, but without the nose-to-ground of a happy pup. She is doggedly determined to just get back . One final detour as we round the corner to the car park: the beach where Canada Geese sunbathe. At our approach the honking begins, each adult joining the call to flee. “To the water, to the water, to the water!” Goslings waddle to the river edge and quickly slide into what I can now smell–the stinky, brown Susquehanna. An oily residue coats the surface and the fluid teases my thirsty one year old birthday girl instead of offering an early drink. Barely acknowledging the goslings and assorted adult geese Luci just looks at me in admonishment, “You have clean water in the car!!! !” As we make the final trek I plot my strategy for teaching Luci and Cappy how to wear a pack. Next adventure we will carry water and treats WITH us. Once back at the car Luci and I drank our ice-cold, clean water happily. “Happy is as happy does.” states the childhood ditty that some adult probably offered to cajole me into doing something I didn’t want to do. I now add it to my Secrets of Adulthood list. In spite of the heat, and the left-behind water, the biker who belatedly called “On your left!” and the unwelcome appearance of gnats, I had been happy. I savored the adventure with my birthday girl, taking time to feel the sun, to identify the bird songs, to smile at my fellow adventurers, and to pet my pup’s silky coat. Turns out happy is as happy does.